I spend at least an hour a week in the local Giant Eagle grocery store. Let’s just say it’s not Whole Foods, but it’s a lot better than Jewel in Chicago. It has a nice balance of organic and regular foods. Thumbs up, but not way up. Each month, I grab the awesome newsletter from the front of the store. It’s similar to the book that Whole Foods has, 8x10 on paper that smells good, but minus the good coupons. Let me just say this thing is awesome. It always has the coolest recipes. In the June issue, they feature beverages from the Smoothie Bar that’s located in our local store. 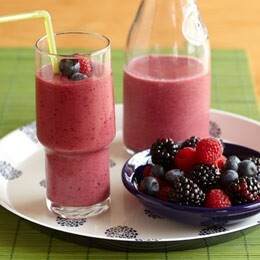 I thought this was good inspiration if you like to make smoothies at home, like me. Since all the fruit is frozen, you just put all that stuff in a blender and hit the go button. N need for ice! And if you go to the Robinson Market District Giant Eagle, be sure to say hi to Reader Jillian (in the pharmacy) and Reader Aunt Michelle (greeter).